I hated giving up my Phase Stormer 2.0, the basis for achieving the newest Nanovor, the Phase Spiker 1.0, but, it had to be done. A word of caution, if you don't want to see spoilers about how to gain the Phase Spiker, stop reading now. 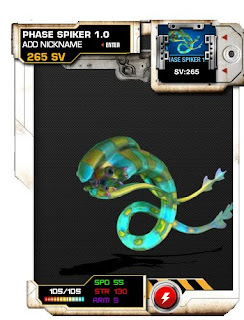 First off, obviously, you'll need to take your Phase Stormer 1.0, gained as a random badge reward, or via Booster Packs bought using the currency of Nanovor.com, nanocash. Noticing a trend in naming...me too. 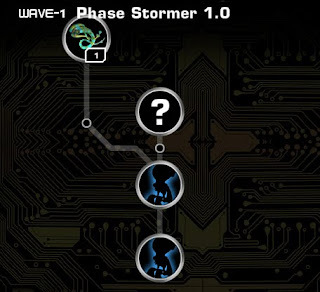 From the Phase Stormer 2.0, things become more involved, as you must discover "Doc Zap's" secrets in the first puzzle that Nanovor.com has thrown out. Figuring this part out, garners you a new badge and unlocks the evolution tree to your new goal. Again, the Nanolog is your friend, use it, read it, the clues and information are all there to gain your new Nanovor, as well as various ideas on badges that are easy to achieve and allow you to enjoy the game even more. Now, figuring out the combination of the exact four EM's to place in the correct order to gain the Phase Striker 1.0, that's a bit more of a pain. Honestly it takes long enough to go through the process of gaining the badge and evolving up to that point. Remember, I'm the old guy playing video games here, I've only *cough cough* got so much *cough cough* energy to keep up with you kids :P.